It’s getting very interesting flying into secondary markets in Asia. A good case in point is Siem Reap in Cambodia. In the centre of the country and home to the ancient Angkor Wat temples, it isn’t very far from the countries capital, Phnom Penh. So, I’m kind of expecting an aluminum hut on a bumpy runway. Not so, we find a perfect little four gate terminal. Brand new, spotlessly clean with probably the best gift shop in Asia. It’s packed with tasteful reproductions of temple art, fabrics and local crafts. Beautifully displayed and not a tacky item to be found. Go to Bangkok for that. We are taking advantage of another religious holiday weekend in Singapore to strike one of the ‘ ‘must go’s’ off our list. Only an hour and a half from Sing, this, and Hanoi are the two places we really wanted to see this year. We have been told Cambodia is changing at an amazing pace after decades of war , and if we want to see it and experience it before tourism totally takes the place over, we had better do it fast. A short drive to our hotel clearly indicates this is still third world, but tourism is clearly winning out as dozens of new Motel 6 like hotels line the streets largely catering to Chinese tourist groups. Down the dusty main drag (dusty as intricate brick sidewalks are being installed) we turn into the circular drive of our very urban hotel - the Hotel de la Paix. We take a brief tour to Angkor Thom, a whole city built in the 9th and 10th century. You enter by the ‘S‘ gate guarded by dozens of giant heads riding a ‘Naga’ on either side of the entry bridge. The ‘Naga‘ or Cobra snake symbol is everywhere. In this application the giant heads are gods on one side and demons on the other. Once inside there is a half mile long tree lined road to the temples and palaces. It is simply huge with walls 3 KM long on each side. Lunch, tour, spa, pool, drinks, dinner, sleep and up at 5:00 AM for the 15 minute drive to the main temple. Dawn at Angkor Wat. We are not alone. Dozens of tour buses line the side of the giant moat that surrounds the complex. Hundreds and hundreds of people walk the long stone path to the inner wall where everyone clambers up for the required beauty shot with their digital cameras. No rosy sunrise today. However, fairly nice reflection from the pond and we are wandering the nearly empty temple by 7:00 AM. Angkor Wat was built in the 12th century and means “ City Pagoda “ or , more literally ‘the city which became a pagoda’. It is huge and capped by 5 giant towers. In its endless galleries are the fabulous bas relief carvings that tell the whole history of ancient Cambodia. The intricacy is amazing and our guide could walk us through hundreds of years of history in just 50 yards. One lovely moment was standing quietly and watching a Buddhist ceremony that was the initiation of two young boys. Most all boys spend a few years as monks and it was a very special thing to watch. We are done at 9:00 AM and our guide and driver suggest we scoot over to Ta Prohm and beat the hordes that will start arriving in a few hours. Ta Prohm is where ‘Lara Croft Tomb Raider’ was filmed. The French who discovered it in the early 1900’s decided to leave it un-restored and that was a brilliant call. Throughout the complex giant silk cotton trees and strangler figs grow up through cracks in the the stones, and in some areas, almost take the place over. It is magical and you simply can’t take a bad picture. Color, black and white, underexposed, overexposed; every one is magic. 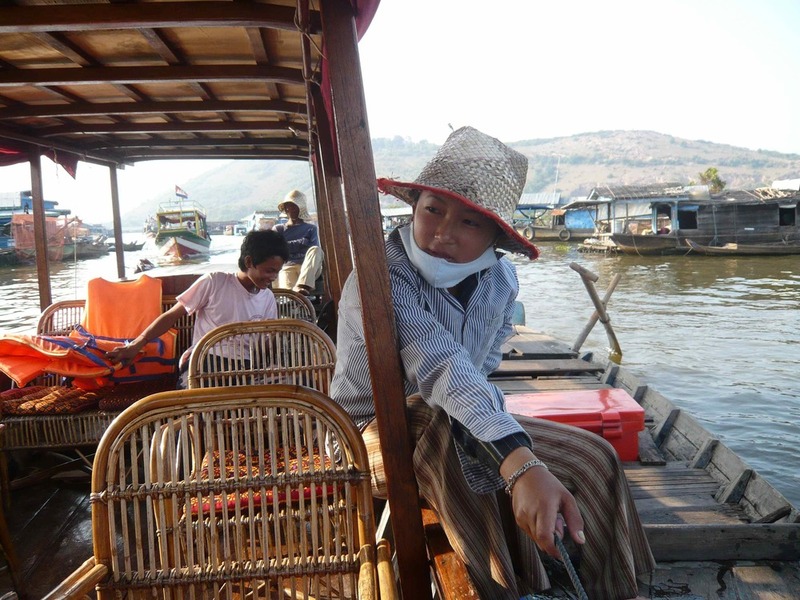 Rather than return to the hotel and laze around the rest of the day, we accept the guides idea to tour Tonie Sap lake. 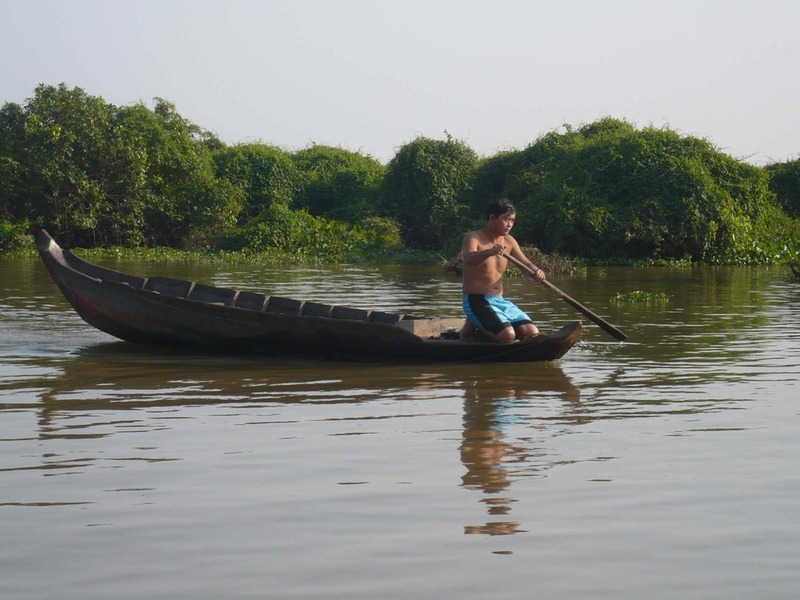 This lake dominates the map of Cambodia and provides over half the fish in the country. Very shallow, it grows in size 5 fold in the rainy season and is one of the main sources of the Mekong River that flows south all the way to Ho Chi Minh in Vietnam. The drive there is fascinating. Literally, a road on top of a dyke with odd, partially covered platforms on each side over the water. These are “rest” places. Living outside Siem Reap is so congested people go out here to rest. Each place has racks of hammocks, as many as 30 or 40 just to grab a quiet nap. We arrive at the very busy and very touristy town of Chong Kneas where we engage a boat to head out the channel to the main lake area. These are the floating villages of Cambodia. Hundreds of rickety structures on stilts where the fishing population lives year round. There are schools, banks, playgrounds and, in one place, a giant sign announcing a slick condo hotel development. It couldn’t seem further out of place. Dipping my foot in the water on the way back prompts a warning about crocodiles being hungry this time of year. That, and the racks and racks of drying snakes on the roadside reminds us where we are. That evening we hop on a cyclo and take a 5 minute drive to ‘Bar Street‘. A few years ago there were two bars in town, now there is an entire street. Perhaps 100 bars and restaurants on this long, two story avenue. No cars or cyclos allowed at night, the place is alive with locals and tourists. 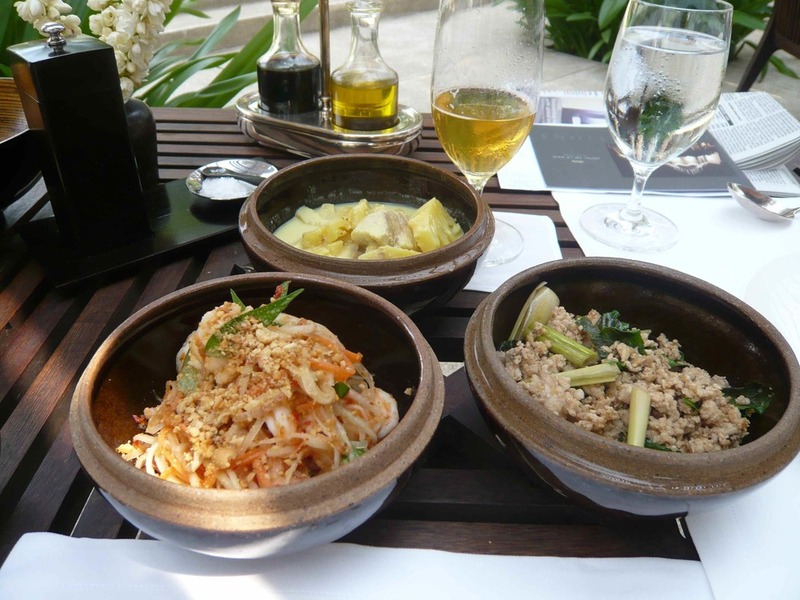 We pick a place recommended by the hotel called ‘Khmer Kitchen‘ and the food is fantastic. Khmer is like Vietnamese (the Vietnamese occupied Cambodia for more than 5 years recently and many times over its history) and it is fresh, delicious and cheap. Our friend Adam from Singapore is in town with some pals and drops by for drinks. Angkor beer is famous in Asia. At one time an empty can went for $10 U.S. Dollars among beer fans as it was so rare. Excellent beer, we are stunned to find it sells for less than $1 dollar a quart. Dinner for three and all the beer we could drink is $12 US dollars. 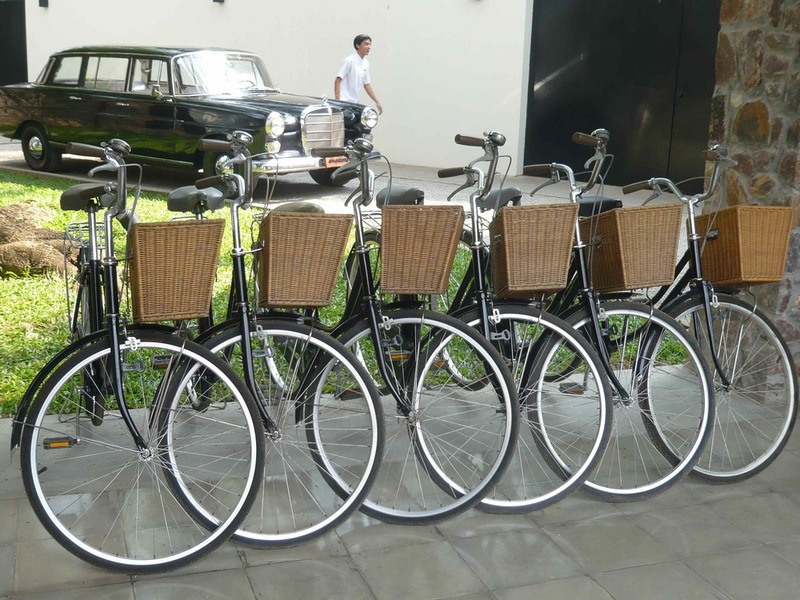 We cyclo back to the hotel for $2 dollars. I think I overpaid by half. And so we are done. More than Angkor and Ta Prohm there are hundreds of temples built in various styles starting in the 6th century and continued through the 13th. At some point the huge population just disappeared. Some say wars or decisions to move the capital south to the Phnom Penh area were the cause. In time, the jungle took over and for centuries the whole place slept hidden from view. The French ‘Ecole Francaise d’Extreme Orient‘ discovered it in 1908 and began documenting and clearing out the jungle. The Cambodians insist it was never lost and that it was used for religious ceremonies all the years it was supposed to be hidden away. Whatever, it is a truly magical place and a photographers dream. Now, they are all Unesco World Heritage sites and they are completely open. All the temples, including Angkor, have no boundaries, no railings, no restricted areas. You wander with or without your guide to your hearts content. I’m told this will all change in the next few years and access will become much more restricted. Not entirely a bad thing as something like this 10 centuries old has a habit of falling down from time to time. A lot of what we saw and where we walked is truly dangerous and there are more than a few stories of tourists tumbling down steep stairs or falling off places they should never have been in the first place. Go soon. No visit to Cambodia can ignore the terrible history and the horrible aftermath of the Khmer Rouge. Authorities now feel 2.5 million people were killed out of a population of 7 million. A whole generation of adults are missing in this society. Teachers, doctors, academics were all killed as well as farmers. You could be killed for wearing eyeglasses as that made you one of the elite. There is almost no working agriculture in one of the most fertile countries in Asia because that generation of farmer is dead. Fruit is sold at every roadside stand and it all comes from Thailand. When they took over the country in 1975 they emptied the capital of Phnom Penh. Emptied it and sent 2 million people into the rice fields. That is the equivalent of emptying Metropolitan Toronto and sending every living person walking to Barrie. 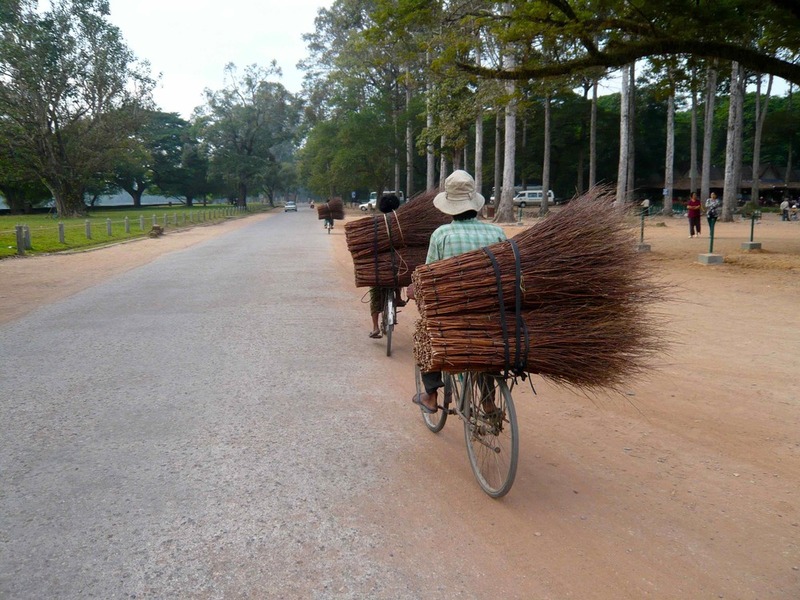 They wanted to transform Cambodia into a rural, classless society. They abolished money, there was no law, no schools, no hospitals, no religion, no medicine, no private property, no public or private transportation and no social structure or infrastructure at all. There was no humor, no affection or pity allowed. The population wore only black and no conversation could be held by more than two people at once. People ate snakes, bugs and grass. They love snake even now and by the roadside hundreds of them are hung to dry on racks. We were offered grilled tarantulas as a snack. This only began to wind down in 1998 with the death of Pol Pot, Brother Number 1. The killing finally stopped in an armistice in 2000. Our guide said he had only known peace for 7 years. Every night of his youth he slept through gunfire and was able to sense in his sleep when it got too close and he had to hide. Their stories are amazing. No one has been brought to trail for this, yet. The tribunals have been fraught with politics and the leaders are now old men, but they will try a few this year. Brother Number 3 was arrested in his palatial villa a few months ago and Comrade Duch, who ran the infamous S-21 interrogation facility in Phnom Penh where 14,000 died, has been arrested and is waiting trial as well. I watch the movie “The Killing Fields” now with a whole new understanding . Then there are the kids. Beautiful, even more so than the Vietnamese. Hundreds of thousands of orphaned children in a country only 7 years out from under 25 years of war. We went to a Cambodian orphanage/medical outreach fundraiser at the Fullerton Hotel here on our return that raised $160K Sing in a fabulous silent and live auction. That will build them a new school. These people take care of thousands of kids on a total budget of only $300K U.S. No people on earth need or deserve help more than the children of Cambodia. The guide books all say not to mention the war as the memories are too recent and too raw for the people. It does seem a distant and surreal concept as you leave your gorgeous 5 star hotel in your shades, ball cap and linen shorts laden with camera bags, sunscreen and bottled designer water. The guides bring it up with ease, and while their stories are shocking, all the people appreciate your interest and support. In fact the more interest you show, the more questions you ask, the more they relax and open up. We were leaving Ta Prohm down a long dusty path. In the distance I could see a one legged man sweeping the dirt with a thatch broom. Our guide said there was a small musical troupe of war amputees and it would be good if we listened and gave them a little money. They had a sign in Thai, Khmer and English that said: “We are not beggars. Please let us entertain you with our music so that we may have some dignity in our lives. Please only give what you can and only if you like our music”. As we listened, a stretched white Land Rover with ‘CMC’ in red letters drove up the path and turned off about 20 yards from us. About 6 or 7 men got out and started putting on their gear. Cambodia Mine Control. There are thousands upon thousands of unexploded plastic land mines all over the country and just 25 yards off this dusty path. They hope to clear them from populated areas around 2015. Some will be there, waiting to do their deadly work, forever. Update 2103: We haven't been back, but, friends have recently and loved it now as much as we did over 5 years ago. 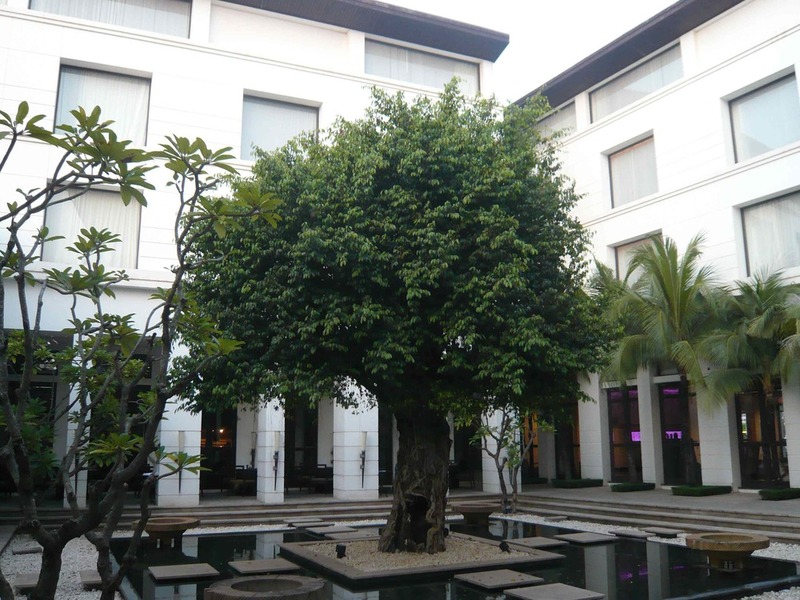 The 'Hotel de la Paix ' is now a Hyatt and there are many more charming hotels and guesthouses. It's still packed with tourists, lot's of Chinese but we sense it hasn't yet been spoiled. The temple complexes are so vast that people are now ranging farther a field than just seeing Angkor. The trials of the Khmer Rouge principals have been underway now for a few years but they are so old now there seems little point in punishing 90 year old men. Still, it is one place in Asia that remains a must see.